Shamir Bailey, a 20 year old Las Vegas native, has reintroduced the funky electro music of the 80’s. If you’re into any artist who has fun with their music by adding catchy phrases and quirky beats, you are going to love Shamir. His musical vibe has been compared to those such as Azealia Banks and even Prince. He released his first EP in June of 2014 titled “Northtown”, named after his neighborhood in Las Vegas, which earned him a record deal with XL Recordings. Shamir’s debut album, “Ratchet”, recently dropped on May 19 and has received positive feedback. He begins the album with Vegas, a sedated tempo track that talks about the city and how it seems full of excitement to visitors, but hell to those who reside there. On The Regular (below) shows off Shamir’s fun and flamboyant side, especially with the cheeky line, “Don’t try me, I’m not a free sample”. The sass and cool synths that were used throughout the song create a very enjoyable sound. The vibrant disco-infused production and lyrics asserting his confidence makes the album entertaining. Call It Off certainly displays that young Michael Jackson vibe with the vocals that are heard throughout. The production has that signature 80’s disco approach; something similar to Prince. It’s a self-empowering song that advises anyone going through a negative obstacle in their life to put it to an end. Shamir’s androgynous voice fits the synthpop feel of his music perfectly. His amazing vocal range is shown off really well in Darker, a more tranquil sounding track. When he sings, it doesn’t sound like he is straining to get the high notes at all, which showcases how talented this young artist really is. 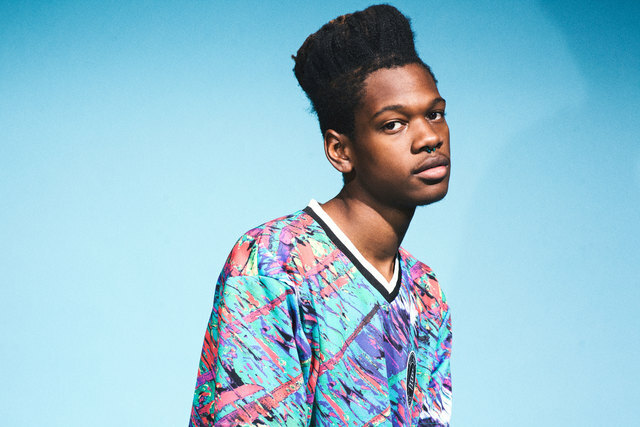 Shamir’s vibe is eccentric, fresh, and exuberant. Ratchet did not disappoint and I’m looking forward to more of his music. Ratchet is available on iTunes and Google Play for about $10. Trust me, it’s worth it. Be sure to follow Shamir on Twitter @ShamirBailey as well.